Modern structural steel is complex, requiring steel erectors across the company to adapt and improve to keep with current trends and technology. Sanilac Steel is here to provide innovative solutions that ensure your building is constructed in a safe, efficient, and affordable manner. 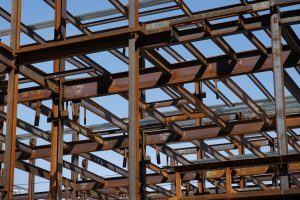 Whether you have a new construction project or are renovating an existing building, Sanilac Steel has the structural steel erection and installation services that you need. Our team has the skills and experience to help you with projects both big and small, ranging from small bridges to major industrial buildings. We’re known in the steel erection industry for both our safety record and our commitment to delivering each project with excellence from, start to finish. With over 50 years of experience in structural steel fabrication and installation, our skilled personnel knows how to use the safest and most efficient methods for structural steel erection. We understand the requirements for bolting, welding, rigging, connecting and everything else that goes into steel installation. Thanks to our methods and experience, we help our clients identify possible areas of concern for their project, mitigate risks, and innovate solutions that help them keep moving forward. We can handle all aspects of the steel design and fabrication of your project, as well as the steel frame construction and installation. With plenty of hard work, integrity, collaboration, and a commitment to excellent communication with our clients, we’ve become an industry leader in structural steel erection. We’re a premier steel installation and erection company in Michigan, and we’re ready to get to work on your project. Give us a call or contact us through our website. One of our team members will get more details about your project and start working with you on how we can get the job done. We’ll complete your project the right way, exceed your expectations, and stand behind everything that we do. Call us today!